Small non-coding RNAs (sRNA) are emerging as major components of the cell’s regulatory network, several possessing their own regulons. A few sRNAs have been reported as being involved in general or toxic-metabolite stress, mostly in Gram- prokaryotes, but hardly any in Gram+ prokaryotes. Significantly, the role of sRNAs in the stress response remains poorly understood at the genome-scale level. It was previously shown that toxic-metabolite stress is one of the most comprehensive and encompassing stress responses in the cell, engaging both the general stress (or heat-shock protein, HSP) response as well as specialized metabolic programs. Using RNA deep sequencing (RNA-seq) we examined the sRNome of C. acetobutylicum in response to the native but toxic metabolites, butanol and butyrate. 7.5% of the RNA-seq reads mapped to genome outside annotated ORFs, thus demonstrating the richness and importance of the small RNome. We used comparative expression analysis of 113 sRNAs we had previously computationally predicted, and of annotated mRNAs to set metrics for reliably identifying sRNAs from RNA-seq data, thus discovering 46 additional sRNAs. Under metabolite stress, these 159 sRNAs displayed distinct expression patterns, a select number of which was verified by Northern analysis. We identified stress-related expression of sRNAs affecting transcriptional (6S, S-box & solB) and translational (tmRNA & SRP-RNA) processes, and 65 likely targets of the RNA chaperone Hfq. Our results support an important role for sRNAs for understanding the complexity of the regulatory network that underlies the stress response in Clostridium organisms, whether related to normophysiology, pathogenesis or biotechnological applications. Small non-coding regulatory-RNAs (sRNAs), discovered on the genome of all bacteria so far examined, have been established as an integral component of the regulatory system of the cell [1–3]. Unlike their counterparts in eukaryotes, which are about 20 nucleotides long, sRNAs in bacteria span a wider size range between 50 to 500 nts . Regulation of gene expression at post-transcriptional level by sRNAs has been established in both Gram-, such as Vibrio fischeri, Pseudomonas aeruginosa, and Escherichia coli[1, 7], and Gram+ bacteria, such as Bacillus subtilis, Listeria monocytogenes and Streptococcus pyogenes. Identification of sRNAs in bacteria has been carried out experimentally using whole genome microarrays, intergenomic tiling arrays, shotgun cloning and, recently, RNA deep sequencing (RNA-seq) [7, 11–14]. In silico prediction of sRNAs has been carried out using comparative genomic analyses by employing algorithms such as SIPHT , QRNA , ISI , and sRNAscanner . Experimental detection of sRNAs that are expressed only under specific culture conditions may not be successful at other conditions, while computational methods relying on sequence conservation may not identify species-specific sRNAs. Hence, a combination of the two approaches should be logically preferable. A number of sRNAs have been identified to play an important role in the response to stress in Escherichia coli, such as in oxidative stress (OxyS) , cold shock (SraF, SraG and SraJ) , iron depletion (RyhB) [20–22] and sugar stress (SgrS) . The best and most celebrated case so far uncovered is the regulation of the major stress sigma factor, RpoS, in E. coli. RpoS orchestrates the cellular response to a variety of stresses and the transition to the stationary phase, and is regulated at the post-transcriptional level by several sRNAs. DsrA, RprA and ArcZ are positive regulators the RpoS expression, while OxyS is a negative regulator [24–26]. Yet, little is known regarding a role of sRNAs in the stress response of Gram+ prokaryotes, and nothing about the role of sRNAs in the response to chemical stress. Here we are focusing on the stress-responsive small RNome of Clostridium acetobutylicum, a model organism for the Clostridium genus and more broadly the anaerobic endospore formers . Clostridium organisms are Gram+, endospore-forming firmicutes capable of fermenting a very broad set of substrates and are of great importance in human and animal pathogenesis and health, cellulose degradation, non-photosynthetic CO2 fixation, bioremediation and biotechnology, such as for the production of solvents and other chemicals in the context of biofuel and biorefinery applications [27, 28]. The response to chemical stress, whether from autologous metabolites or allogeneic toxic chemicals (such as from carboxylic acids, high H+ concentrations (low pH), antibiotics, and solvents like ethanol and butanol), plays a major role in cell physiology. Chemical stress affects cell survival, metabolism, sporulation and pathogenesis in physiological milieus, such as the gut microbiome , and pathogenesis [19, 30–32], and the natural environment. Chemical stress is a major and well recognized problem in modern bioprocessing due to toxic substrates and desirable or undesirable toxic metabolites . Chemical stress in Clostridium organisms engages the general stress response, better known as the heat-shock protein (HSP) response, as well as more specialized responses. The HSP response involves strong upregulation of all major HSP proteins, including those of the GroESL and DnaKJ systems. Specialized responses include the acid resistance systems under acid stress [34–36], and changes in metabolic and biosynthetic programs in response to both acid and solvent stress [35, 37–39]. Thus, chemical stress is one of the broadest stress responses known in this and other prokaryotes, and as such, understanding the stress-related small RNome under chemical stress is of broad and general interest. C. acetobutylicum carries out the biphasic ABE (acetone-butanol-ethanol) fermentation, which consists of an acidogenic exponential phase resulting in the production of butyrate and acetate, followed by the solventogenic stationary phase characterized by the production of acetone, butanol and ethanol, and driven by the reassimilation of the acids. Using a SIPHT-based comparative genomics method, we recently predicted the existence of 113 sRNAs in C. acetobutylicum, among which 31 were validated by either Q-RT-PCR or Northern analysis . The goal of this study is to identify sRNAs, at the genome scale, that respond to butanol and/or butyrate stress and possibly start assigning mechanistic roles for these sRNAs. sRNAs that modulate the stress response can be engaged to engineer strains tolerant to these toxic metabolites, as we and others have recently reported for both C. acetobutylicum and Escherichia coli[36, 41]. Using RNA-seq, we aimed to identify sRNAs (previously predicted  and novel) that are differentially expressed under butanol and butyrate stress. To do so, we aimed to collect a large set of temporal data, which, based on our experience are more likely to lead to robust discovery outcomes [35, 38, 39, 42]. Cultures of C. acetobutylicum were grown in batch mode in 4-L bioreactors up to the mid-exponential phase of growth (O.D ~ 1.0), at which point the cultures were stressed with three different concentrations of butanol and butyric acid, respectively, in 3 biological-replicate experiments each. For butanol stress experiments, the cultures were stressed with 30 mM (low), 60 mM (medium) and 90 mM (high), while for butyric-acid stress, 30 mM (low), 40 mM (medium) and 50 mM (high) butyrate concentrations were used. These levels of metabolite stress were chosen based on prior studies [35, 38, 39] and preliminary experiments to achieve the desirable low, medium or strong metabolic response to the applied stress. Cultures were sampled at 15, 30, 60 and 75 min post stress for RNA isolation and sequencing. These sampling times, which are of the order of the doubling time of these cells, were meant to capture largely the direct and immediate impact of these stresses on gene expression and the small RNome. Following RNA isolation, mRNA and sRNA enrichment, cDNA generation, adapter ligations and indexing, libraries were deep sequenced using Illumina’s second generation HiSeq 2000 with a read length of 50 bp. High sequencing depth was observed for all 84 sequenced libraries from samples representing 7 distinct culture conditions with 4 time points and 3 biological replicates each. On average, for each sequenced library, 18,162,979 total reads were obtained, which are indicative of a high sequencing depth (Additional file 1). From these, for each sequenced library, 9,537,317 reads were mapped into the genome with 884,618 distinct reads after discarding unreliable reads. 46.5% of the reads mapped to annotated genes, while 2% of the reads were mapped to the 113 sRNA we have previously predicted . The balance reads were mapped to structural RNA components (47%) and interoperonic (IOR; genomic DNA between operons ) and intergenic regions (IGR; DNA between annotated ORFs) (5.5%). These data suggest that the stress transcriptome is very rich in transcripts beyond those coded by ORFs and rRNA components. Aiming to identify novel sRNAs and also assess which sRNAs are transcribed as part of the stress transcriptome, we desired to set metrics that would allow us to call experimental reads from the RNA-seq data as factually identifying sRNAs. To do so, we used two criteria for identifying novel sRNAs on IORs. First, we selected IORs with RNA-seq expression exceeding a minimal value of read counts based on the previously annotated sRNAs as well as annotated ORFs (protein coding mRNAs) (Figure 1). The majority (ca. 75%) of annotated mRNAs had a minimum of 50 read counts (Figure 1A). The 113 sRNAs we had previously predicted  were divided into two categories: 31 previously validated sRNAs and the balance of 82 sRNAs (Figure 1B and 1C). As expected, read counts for sRNAs were lower than read counts for mRNAs. The majority of the previously validated 31 sRNAs had read counts over 50 (Figure 1B). The remaining 82 sRNAs had a read count distribution more skewed towards lower read counts (Figure 1C). Based on these data, we chose 50 as the read count that would most robustly identify IORs containing new sRNAs. No effort was made in this study to identify sRNAs coded on the opposite strand of annotated ORFs. Using this “minimum 50” read count criterion, 729 IORs were identified as possibly containing novel sRNAs. The frequency distribution of the read counts for all annotated ORFs (A); 31 of the 113 predicted sRNAs that were previously validated by Q-RT-PCR and /or Northern analysis (Chen et al. 2011) (B); the remaining 82 of the 113 predicted but not validated sRNAs (C); and all interoperonic regions (IORs) (D). As the second selection criterion, SIPHT-based computational analysis for predicting sRNAs in the genome of C. acetobutylicum was performed, and 79 sRNA candidates, in addition to the previously identified 113 sRNAs, were found to be present within these 729 IORs. These were chosen for further analysis. To minimize false positives, we eliminated from the candidate list IORs having read counts predominantly from the 5’ and 3’ untranslated regions (UTRs) of the neighboring ORFs (genes), provided the neighboring ORFs also had a significant read counts (≥ 50). This elimination process was executed with the aid of a custom web viewer built to visually analyze the RNA-seq data (Figure 2). Following the screening for false positives, we successfully identified 46 novel sRNAs (Additional file 1). Custom web viewer to analyze the RNA-seq data and predict novel sRNAs in C. acetobutylicum. RNA-seq data screenshots of two predicted candidate sRNAs and their orientation (thick arrows), neighboring genes (→/←) and Rho-independent terminators ( Ϙ) are shown. The sRNA in (A) INTEROP0218 (sCAC381; a predicted Hfq target: see text) was validated by Northern analysis (Figure 5), while (B) sCAC1893 (INTEROP1092) was found to contain σG element (Additional File 1). BuOH- butanol, BA- butyrate, NS- no stress, 30 & 60 min post stress. We examined the expression profiles of the 159 (113 previously identified and the newly identified 46) sRNAs aiming to identify which are expressed and differentially expressed under the various metabolite-stress conditions. 114 of the 159 sRNAs had a minimum expression of 50 read counts in 20% of the sequenced libraries, while 70 of the 159 sRNAs had read counts over 50 read counts for 90% of the sequenced libraries representing a very broad set of culture conditions. Expression of genes and sRNAs are specific to culture conditions and not all of them are expressed at all culture conditions. Thus, expression of over 60% of the predicted sRNAs under all culture conditions in this study provides strong support for an important role of sRNAs in orchestrating the cellular response to metabolite stress. Using pair-wise (for each time point) analysis of the 159 sRNAs for each level of metabolite stress against the unstressed control, we identified sRNAs that were differentially expressed with a p-value (DEseq analysis, Bioconductor package) ≤ 0.05. 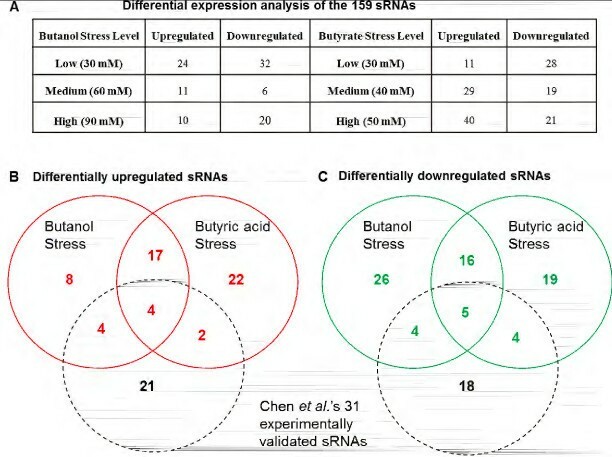 Under both butanol and butyrate stress, the number of differentially expressed sRNAs were found to be dependent on the level of stress (Figure 3A). For example, we identified 32 of the 159 sRNAs as being downregulated under low butanol stress (Figure 3A). In contrast, under medium and higher levels of butanol stress, the number of downregulated sRNAs was significantly lower. Under butyrate stress, the largest number of downregulated sRNAs was found at low levels of stress, as well. This larger number of differentially downregulated genes under lower stress levels was also observed in the mRNA expression analysis (Additional file 2: Table S1). Differential expression analysis of the 159 sRNAs under metabolite stress. (A) Table representing the output of the differential expression analysis of the 159 sRNAs under butanol and butyrate stress. Comparison of the differentially upregulated (B) and downregulated (C) sRNAs under stress with each other. The black circle represents the comparison between the differentially expressed sRNAs under metabolite stress with the subset of 31 experimentally validated sRNAs from Chen et al. (2011). Butyrate stress gave rise to more (45) differentially upregulated sRNAs than butanol stress (33), while butanol stress had more differentially downregulated sRNAs (51) compared to butyrate (44). 42 sRNAs were differentially expressed under both metabolite stresses: 21 were upregulated and 21 were downregulated under both stresses (Figure 3B & 3C). Although the two metabolite stresses result in differential expression of specific sets of sRNAs that are stress and dose dependent, we found a considerable conservation of expression patterns for the two stressors among these sRNAs, thus suggesting a possible role of these sRNAs in the general stress response. Among the differentially expressed sRNAs under metabolite stress described above, 31 have been previously validated by Northern and/or Q-RT-PCR analysis . Here, we used Northern analysis (using single-stranded DNA probes to identify the strand specificity of the sRNA ) to examine the patterns of expression of a select number of differentially-expressed sRNAs. Selection was based on potential relevance to metabolite stress response (see below), but also on the ability to design probes, which requires that sRNAs have high GC content or GC rich regions. tmRNA (sCAC834), when analyzed by Northern blot, resulted in a single prominent band of ca. 300 nts. 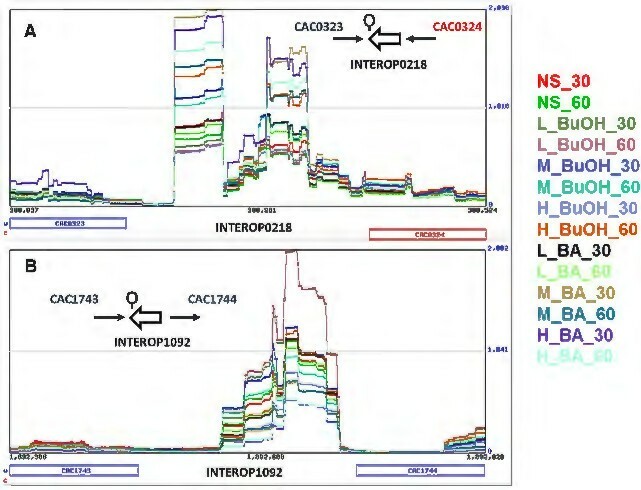 Northern blots of 6S (sCAC1377) and S-box (SAM, sCAC1132) (Figure 4) revealed multiple bands indicating possible post-transcriptional processing by enzymes such as RNaseP, as has been reported . Validation of sRNA expression by Northern analysis. (A) 6S RNA; (B) tmRNA; &(C) SAM. The right arrow ( →) and left arrows (←) indicate the positive or negative orientation of the genes adjacent to the sRNA, while the orientation of the sRNA is represented by the double lined arrow. The symbol P, upstream of the sRNA represents the presence of a promoter region corresponding to one of the sigma factors (A, G, E & F) and the Ϙ symbol at the 3’ downstream end of the sRNA represents the rho independent terminator. The 6S RNA secondary structure shows the conserved asymmetric bubbles with G-C pairs at the end (arrows) (see text for details). BuOH- butanol, BA- butyrate, NS- no stress, 30 & 60 min post stress. The sRNA predicted on INTEROP0218 (sCAC381 - 174 nt - predicted length), INTEROP0009 (sCAC22 - 48 nt - predicted length), INTEROP1858 (sCAC3276 - 129 nt - predicted length) and INTEROP1958 (sCAC3463 - 156 nt - predicted length) were successfully validated as being metabolite-stress responsive, with experimentally-estimated sizes (Figure 5) consistent with computational predicted lengths. Northern analysis of sCAC381 revealed two bands (~300 bp and ~174 bp), indicating possible RNA processing or two transcriptional start sites (TSS for the larger transcript may be located upstream of the regular TSS, but this needs to verified using either strand specific sequencing or 5’RACE). Northern analysis of select, newly identified sRNAs and their predicted secondary structure. (A) sCAC381; (B) sCAC22; (C) sCAC346; &(D) sCAC3276. BuOH- butanol, BA- butyrate, NS- no stress, 30 & 60 min post stress. Expression patterns under metabolite stress of the 159 sRNAs were compared against the non-stressed control cultures (pair-wise & point-by-point) and analyzed using hierarchical clustering. 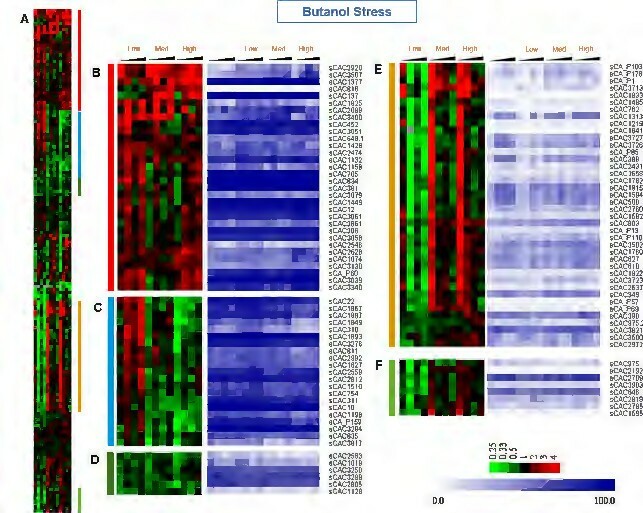 Both butyrate and butanol stress data displayed distinct clusters. Butyrate stress data resulted in four clusters. The 1st, “red”, cluster (Figure 6B) represents sRNAs that were expressed consistently higher compared to the control. The 2nd “green” cluster (Figure 6C) consists of weakly downregulated sRNAs. The 3rd cluster (Figure 6D) contained sRNAs that were downregulated with a small delay post-stress. The 4th cluster (Figure 6E) contains sRNAs showing a stronger (> 4.0 fold) downregulation at all three levels of butyrate stress. The blue plots display the level of relative expression (intensity ranking) among all sRNAs , and combined with the differential expression heat maps, provide a more accurate assessment of temporal patterns in differential expression and strength of expression. The sRNAs in the 1st, 2nd and 4th cluster show overall higher expression levels compared to the sRNAs of the 3rd cluster. Hierarchical clustering & expression profiles of sRNAs during butyric acid stress. The expression profile is presented as the ratio of the normalized read counts under butyric acid stress against the corresponding time point in the no stress control. (A) Hierarchical clustering of the 159 sRNAs. Colored vertical bars represent expanded views of the regions on the right. (B) higher expression during butyric acid stress (C) weakly downregulated sRNAs (D) lower expression with delayed downregulation and (E) strongly downregulated genes. The blue plots show the expression/abundance ranking of each sRNA with respect to others as a percentile between 0 and 100.
sRNA expression under butanol stress also resulted in distinct, but more complex clusters. The 1st cluster represented mostly upregulated sRNAs (Figure 7B). The 3rd small cluster contained consistently downregulated sRNAs (Figure 7D). The remaining three clusters displayed a more complex pattern. The 2nd cluster (Figure 7C) contained upregulated sRNAs only at low levels but not at medium or high levels of butanol stress. The 4th and 5th clusters (Figure 7E & 7 F) consisted of sRNAs that were downregulated at low levels of butanol stress, but not consistently so for medium or high levels of stress. The newly identified sRNAs, sCAC3400 (INTEROP1928), sCAC3507 (INTEROP1985) and sCAC2920 (INTEROP1658) were found to be upregulated under both stress conditions (Figures 6B & 7B), and these sRNAs had relatively stronger upregulation under butyrate stress than under butanol stress. Typically most target mRNAs of the trans sRNAs are located at a distant and different location on the genome. For example, the sRNAs ArcZ, DsrA, RprA and OxyS target the stress specific sigma factor RpoS in E. coli despite being located at different loci on the genome [24, 25]. The differential expression of the sRNAs and their neighboring genes was analyzed by pairwise comparison of the no stress control sample against the three different levels of butanol or butyrate stress, (DEseq, p-value ≤ 0.05). Our analysis found very poor correlation between the differential expression of sRNAs and the neighboring genes (data not shown). Hierarchical clustering & expression profiles of sRNAs during butanol stress. The expression profile is presented as the ratio of the normalized read counts under butanol stress against the corresponding time point in the no stress control. (A) Hierarchical clustering of the 159 sRNAs. Colored vertical bars represent expanded views of the regions on the right; (B) higher expression during butanol; (C) higher expression in low butanol stress (D) weakly downregulated sRNAs (E) and (F) downregulation only in low butanol stress. The blue plots show the expression/abundance ranking of each sRNA with respect to others as a percentile between 0 and 100. The clustered data were analyzed to identify shared regulatory elements, such as promoter sequences and transcription factor binding sites (TFBS) upstream of the sRNAs in the same cluster. Upstream regions of the sRNAs were scanned for putative promoter sites using B. subtilis position specific scoring matrices (PSSM) in the patser program within SIPHT  and the prokaryotic promoter prediction (PPP) tool for Lactococcus binding sites . B. subtilis is the model Gram+ organism, while the (also Gram+) Lactococcus model was used as it has a more similar G + C content (35%) to C. acetobutylicum (29%). Using the B. subtilis model, we predicted that 52 of the 159 sRNAs (Additional file 1 & ) contain putative σA, σE, σF and σG promoters. Using the PPP webtool led to the identification of previously known stress-related motifs. Specifically, we analyzed two upregulated sRNA clusters: B1 (sCAC3507 to sCAC3713, Figure 6B) and B2 (sCAC3184 to sCAC1128, Figure 6B); and two clusters containing downregulated sRNAs: C (Figure 6C) and E (Figure 6E). Motifs for σA, the house-keeping sigma factor, were identified in the upstream regions for most of the sRNAs analyzed. In addition to σA, the upstream regions of the four clusters were enriched in binding motifs for σB (the general-stress response sigma factor in B. subtilis; however no σB ortholog has been identified in C. acetobutylicum or any other Clostridium organism ) and transcriptional factor binding sites (TFBS) for transcriptional factors such as FlpAB (the FNR family transcriptional regulator – which has two C. acetobutylicum ortholog genes, CAC1511 & CAP0082) [48, 49], Llrb (two component system response regulator – with one C. acetobutylicum ortholog gene, CAC1700), Ahrc (arginine repressor – one C. acetobutylicum ortholog gene, CAC2074, coding for ArgR) (Foster, 2004) and Rex (redox sensing transcriptional repressor – one C. acetobutylicum ortholog gene, CAC2713) . These proteins/transcriptional regulators (Figure 8) and their regulons have been identified to be part of oxidative stress response in some, at least, prokaryotes, and this might explain the presence of these motifs on sRNA promoters differentially expressed under butyrate stress, which is frequently similar to oxidative-stress response . 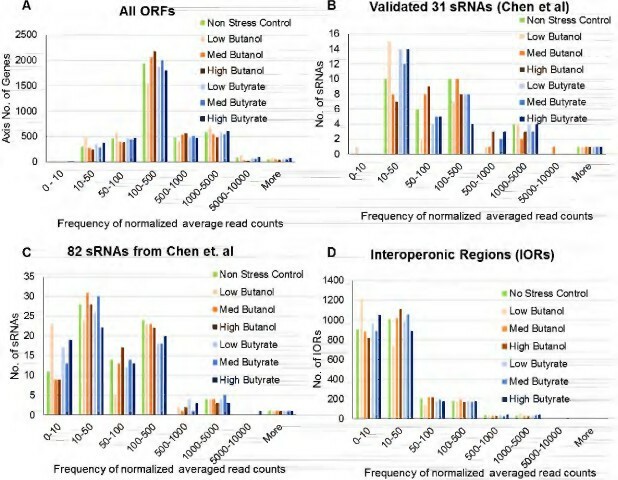 Identification of regulatory elements in the differentially expressed sRNA clusters B1, B2, C and E (Figure 6) reveal the presence of both general stress responsive elements (σB) and the more specific oxidative stress response regulators (FNR, ArgR and Rex) supports the clustering of co-regulated stress responsive sRNAs. Expression profile of genes involved in sulfur amino acid metabolism; part of the sol operon; and genes coding for Hfq and other regulatory proteins (see text for details). In E. coli and a few other prokaryotes, it has been shown that activity of several sRNAs (and notably of many trans-acting sRNAs) requires the assistance of, or is enhanced by, the hexameric RNA chaperone Hfq [51–55]. Thus, we wanted to examine which of the 159 sRNAs in C. acetobutylicum might be Hfq targets, and if these putative targets might be responsive to metabolite stress. sRNAs co-immunoprecipitated with Hfq contain the signature Hfq-binding motif and are designated as Hfq-associated sRNAs [11, 12, 55, 56]. This binding motif was discovered largely based on the E. coli sRNAs, but appears to be valid in other organisms [5, 21, 51, 52, 57] since the Hfq protein is well conserved among many prokaryotes. 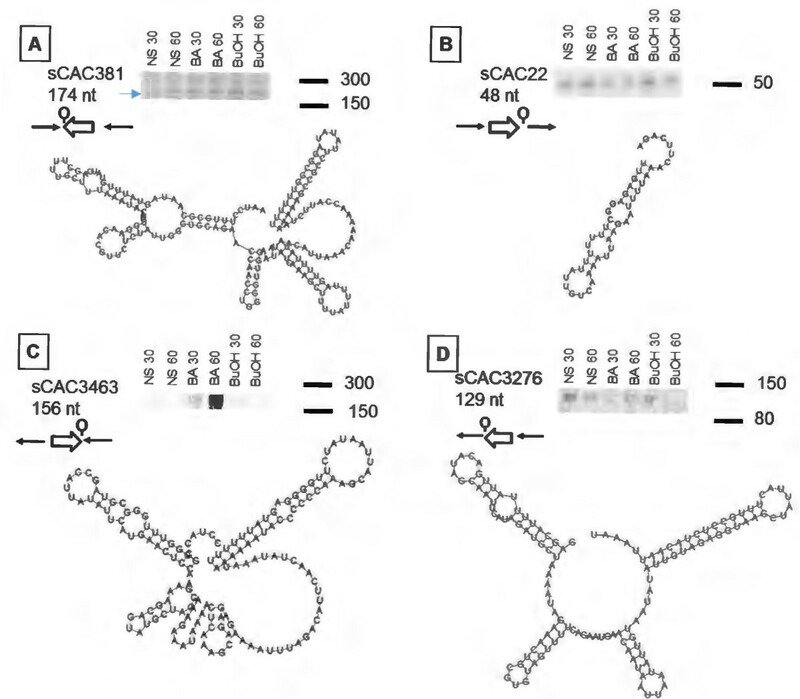 A structural CBLAST of the annotated C. acetobutylicum Hfq (CAC1834) with the two Hfq crystal structures, one from E. coli (3GIB_B) and the other from S. aureus (1KQ1_H), showed conservation in the sequence and the secondary structure of the Hfq monomeric unit (Additional file 3: Figure S1). Thus, we hypothesized that the binding motif of Hfq on sRNAs in E. coli might be preserved on sRNAs from C. acetobutylicum. This Hfq binding motif is characterized by U-rich regions, specifically a poly-U tail at the 3’ end of the sRNA (downstream of the Rho independent terminator), and the U-rich or the AU-rich region upstream of the rho-independent terminator or other secondary hairpin structure; the 5’ region of the sRNA is involved in (non-perfect) base-pairing with the target mRNA [52, 53, 55]. Using this model, we identified 65 potential Hfq-associated sRNAs in C. acetobutylicum. Among these 65 sRNAs, 20 sRNAs belonged to the 46 newly identified sRNA from the deep sequencing data (Additional file 4). We clustered these putative 65 Hfq-associated sRNAs and found most of them to be differentially expressed under both butanol and butyrate stress (Additional file 5: Figure S2). The Hfq gene (CAC1834) was found to be mildly differentially expressed (upregulated) only under butanol stress. Identification of the putative Hfq binding module on 65 sRNAs may prove useful for deconvoluting the stress-responsive regulatory network in Clostridia, since the unstructured 5’ region of sRNAs that are targets of Hfq contains information that can be possibly used to identify potential target mRNAs of these sRNAs . The data presented above showing a large number of sRNAs exhibiting differential expression under metabolite stress provides strong evidence that sRNAs are an integral part of the clostridial stress response system. While the detailed action of these sRNAs remains to be elucidated, there are several sRNAs whose action can be readily related to the phenotypic response of these cells to metabolite stress affecting various metabolic pathways as previously shown [35, 37, 39, 42, 60] and further confirmed by the present set of RNA-seq data as well as the accompanying large set of new microarray and proteomic data . Both butanol and butyrate stress affect membrane physiology and homeostasis by reducing the transmembrane electrochemical potential and proton gradient (ΔpH) [33, 34, 62]. Bacteria respond to the toxicity of these metabolites by altering the membrane composition by increasing the percentage of saturation in the lipid tails and also by incorporating various integral membrane and transport proteins . We have previously shown that the signal recognition particle (SRP) system and upregulation of several membrane proteins are apparently important in imparting butyric-acid tolerance . The SRP, which consists of the SRP RNA and the Ffh protein, recognizes a motif on mRNAs coding for membrane proteins and, thus, transports the corresponding ribosomes to the membrane to synthesize the targeted proteins . In this light, upregulation of the 4.5S SRP-RNA (Figures 6 & 7) is consistent with its role in the biosynthesis and localization of membrane proteins and the role of membrane proteins in metabolite stress response and tolerance . The Ffh gene is not differentially expressed under metabolite stress (Figure 8), thus further supporting its role as a housekeeping protein. C. acetobutylicum, like other Clostridium organisms and most prokaryotes, reorganizes its transcriptional and translational machineries during the transition from exponential to stationary phase of growth and under stress conditions [35, 37, 38, 42, 45, 47, 60, 65]. Downregulation of non-essential transcripts and overexpression of different transcript sets requires a quick turnover in the engagement of sigma factors. The 6S RNA (also known as SsrS RNA) has been shown to negatively regulate the transcripts under the control of the major sigma factor σ70 in E. coli and B. subtilis (where it is better known as σA) during the stationary phase of growth by interacting with the RNA polymerase holoenzyme . 6S RNA has been found to be important in cell survival under stress in both E. coli and B. subtilis[67, 68]. We have previously shown that the 6S RNA in C. acetobutylicum, which displays the conserved secondary structure (Figure 4A) of an asymmetric bubble , is expressed at high levels . Its Northern blot (Figure 4A) confirms its strong expression and displays multiple bands, which correspond to distinct processed RNA forms as in other prokaryotes [66, 69]. In contrast to previously reported 6S RNAs displaying two sRNA forms of distinct size, here the 6S sRNA displays three bands (Figure 4A). 6S RNA acts as a template for binding of σ70, and is thus capable, when upregulated, of titrating σ70 thus leading to downregulation of genes under σ70 control. This stress responsive role of 6S RNA has been established in E. coli[70, 71], and our data support that it has a similar role in C. acetobutylicum. It is notable that the 6S sRNA here contains the two characteristic central bubbles with a short stem loop attached . 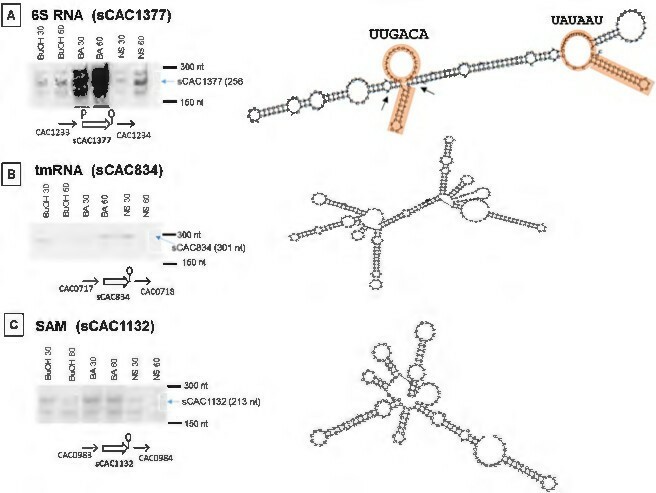 The two components of the σA (the σ70 in C. acetobutylicum) binding motif (UUGACA [-35] & UAUAAU [-10], which corresponds to the DNA motif TTGACA and TATAAT) are found to be perfectly preserved, one on each of the central asymmetric bubbles (Figure 4A), thus apparently regulating the transcriptional responses to metabolite and other stresses. It is interesting to note that in Legionella pneumophila, 6S RNA was found to regulate the expression of secretion system effectors, and stress response proteins such as GroES and RecA . As discussed, the GroESL system is one of the most upregulated HSP systems under a broad spectrum of stresses in Clostridium organisms. The transfer-messenger RNA (tmRNA or SsrA RNA, which has both tRNA- and mRNA like properties) together with 3 proteins (small protein B [SmpB], elongation factor Tu [EF-Tu], and ribosomal protein S1) forms the tmRNP complex. The tmRNP complex is involved in the quality- control, so-called trans-translation process, recycling stalled ribosomes and facilitating the degradation of aberrant proteins and mRNAs [74, 75]. Trans-translation is especially important in the transition between growth phases and under stress conditions [75–77], whereby many ribosomes may stall on damaged or partially degraded mRNAs. In this context, the stress-induced upregulation (Figures 4B, 6 & 7) of the C. acetobutylicum tmRNA (sCAC834) confirms its role in the quality-control process of trans-translation. It is worth noting that tmRNA is one of the most highly expressed sRNAs in these experiments (blue plots of Figures 6 & 7), further confirming its critical roles for the trans-translation process under stress. Of note, none of the three proteins (CAC0716 – smpB, SsrA-binding protein; CAC1964 – rpsA, 30S ribosomal protein S1; & CAC3136 – tuf, elongation factor Tu) of the tmRNP complex appear to be differentially expressed under stress (Figure 8), thus suggesting that the tmRNA upregulation is controlling the trans-translation process under stress. This is the first experimental evidence for the expression and role of a tmRNA in a Clostridium organism. Deletion of tmRNA in Streptomyces coelicolor was shown [78, 79] to affect the translation of proteins that play a vital role in survival such as cell-cycle and stress proteins including the major HSP protein DnaK, a protein universally engaged in the stress response of Clostridium organisms as already discussed. S-box (SAM) and T-box riboswitches regulate the expression of genes involved in the metabolism of cysteine and methionine in C. acetobutylicum and are typically found adjacent to the genes involved in sulfur amino acid metabolism . S-box, which is dependent on the concentration of s-adenosyl methionine (SAM), has been shown to regulate the expression of genes in methionine metabolism through transcriptional anti-terminator systems . In C. acetobutylicum, genes involved in sulfur metabolism were found to be upregulated (Figure 8) during high levels of acid stress. We note that an earlier study from our lab had reported that under acid stress, the genes involved in cysteine, methionine and serine metabolism were downregulated ; this difference between the two studies can be attributed to the role of proton concentration since in this present study, in contrast to the earlier one, we used pH control in the fermentation experiments. 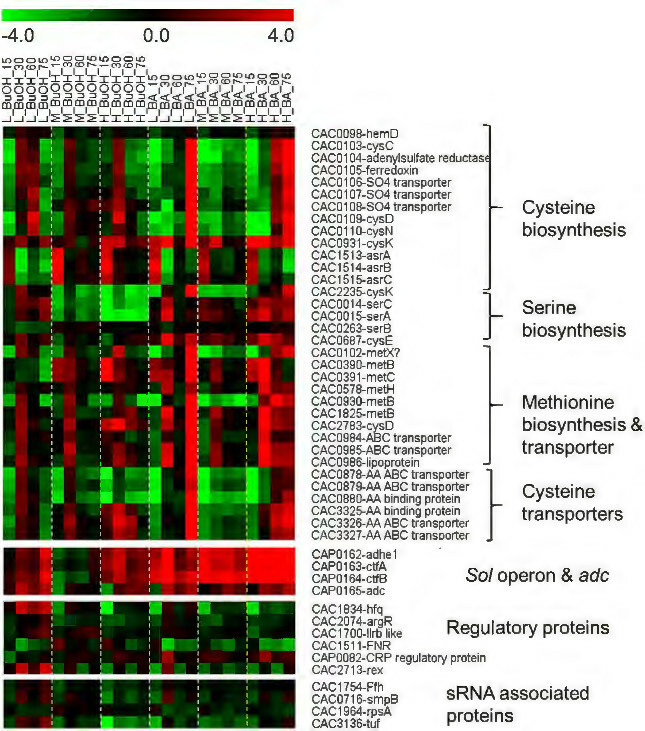 Solventogenesis in C. acetobutylicum is controlled by the pSOL1-megaplasmid borne genes (adhE1(aad)-ctfA-ctfB) of the sol operon and the convergent monocistronic adc operon [81, 82]. Expression of the sol operon is dependent on Spo0A  but other genes are also involved in regulating its expression through a long 5’ UTR, which appears like a good target for sRNA regulation. solB (sCAP_176), located just upstream of the sol operon, has been identified as the putative repressor of the sol operon and thus of solventogenesis . Although expressed at very low levels (Figures 6 & 7), solB appears to be a very potent repressor: upon solB inactivation (originally achieved by inactivating the adjacent gene CAP0161 ), solvent formation starts earlier and leads to considerably higher levels of solvents . Thus, solB downregulation promotes sol mRNA expression and solvent production, and vice versa. Here, we found that solB is downregulated (Figure 6D) under butyrate stress, except for the first time point (15 min post stress). Accordingly, the sol-operon genes display a strong upregulation pattern (Figure 8). Butanol stress leads to a more complex pattern of solB expression (Figure 7E), thus leading to a largely opposite expression of the sol-operon genes, except for the first two time points of the high butanol stress (Figure 8). Schiel et al. (2010) reported a putative antisense binding of the solB repressor to the upstream region of the sol operon  (Additional file 6: Figure S3). The goal of this study was to identify sRNAs that respond to butanol and/or butyrate stress, and also general stress, since, as we discussed, it was previously shown that toxic-chemical stress in Clostridium organisms engages both the general HSP systems as well as specialized systems. One can logically argue that the sRNAs that are differentially expressed under both butanol and butyrate stress would belong to the general stress response. In this sense, the putative roles of SRP RNA, 6S RNA, tmRNA and SAM RNA are part of the general stress response, but perhaps solB belongs to the specialized stress response (Figures 6, 7 & Additional file 7: Figure S4). The metabolite-stress sRNome in C. acetobutylicum was investigated using deep RNA sequencing, in combination with computational analyses. 46 novel sRNAs were identified. The sRNA expression patterns under different levels of butanol and butyrate stress strongly support a role of many sRNAs in orchestrating stress-related cellular changes to deal with the complex, pleiotropic effects of the toxic metabolite stress. This is further supported by the fact that 7.5% of the RNA-seq reads map to non-annotated IOR and IGR of the genome. This is the first comprehensive study of genome-scale expression of sRNAs in a Clostridium or any organism under metabolite stress. Use of extensive temporal RNA-seq data in combination with computational predictions and Northern-based assays are essential in reaching robust outcomes in identifying previously unexplored sRNAs. These data can be used for understanding the role of sRNAs in regulating growth and metabolism thus aiming to provide a more comprehensive understanding of the regulatory network of the cell, and how that network can be engineered for practical applications to produce chemicals and fuels or for remediation processes. Three biological replicate cultures of C. acetobutylicum ATCC 824 were carried out in pH- controlled (pH > 5) batch fermentations in 4 L bioreactors (Bioflow II and 110, New Brunswick Scientific, Edison, NJ, USA) in a defined clostridial growth media . The cultures were stressed with butanol (30 mM, 60 mM and 90 mM) and butyric acid (30 mM, 40 mM and 50 mM) at mid-exponential phase of growth at an OD of 1.0 and were sampled at 4 different time points: 15 min, 30 min, 60 min and 75 min post stress. Parallel cultures (n = 3) that were exposed to neither stress were used as the non-stress controls. Samples for RNA isolation were collected by centrifugation at 5000 rpm at 4°C for 10 min and the pellets were stored at -80°C. RNA isolation was carried out using the Qiagen’s miRNeasy Mini kit . After RNA extraction, mRNA and sRNA were enriched by using Microbe Express kit from Ambion® kit as per the manufacturer’s protocol. The Ovation Prokaryotic RNA-Seq System (NuGEN® Technologies, Inc, San Carlos, CA) was used to synthesize cDNA from 500 ng of enriched RNA. In brief, 2 μL of first primer mix was added to the 500 ng of the RNA and incubated at 65°C for 5 min. Later, 10 μL of the master mix (first strand buffer and enzyme) were added to the above reaction for first strand synthesis followed by the purification of the first strand cDNA using the QiaQuick PCR purification kit (QIAGEN, Inc. Valencia, CA). The last step of cDNA synthesis was synthesizing the 2nd strand, which was then purified using the Minelute Reaction clean up kit (QIAGEN®) and eluted in 10 μL of elution buffer. The elution buffer was used to make up the volume of the cDNA to 50 μL. The resulting 50 μL of cDNA was used to construct libraries using the TruSeq DNA Sample preparation kit (Illumina®, San Diego, CA). In brief, the cDNA underwent end repair, 3’ end adenylation, adapter ligation and enrichment. Clean up of DNA fragments after each process were carried out using AMPure XP Beads. The fragment length of the libraries was checked using a Bioanalyzer before loading onto HiSeq 2000. Deep sequencing was performed using Illumina's HiSeq 2000 with a read length of 50 bp, generating individual library sequence files. Sequence files were processed to remove barcodes, trim adapters, and count read abundances using a set of custom perl, python, and MySQL scripts. Reads were mapped to the C. acetobutylicum genome using Tophat . Gene annotations were downloaded from NCBI, and predicted sRNA regions were included from Chen et al.. Differential expression analysis of sRNAs was performed using DESeq, part of the R Bioconductor package . Differentially expressed sRNAs were determined at a p-value ≤ 0.05, for a pairwise comparison between the control library set and any of the six stress groups (low, medium, and high butanol and low, medium, and high butyrate). Interoperonic regions were defined using previously predicted operons . The data was submitted to Gene Expression Omnibus (GEO) and can be accessed with the accession number GSE48349. The IORs used in this study were the same as those identified and used by Chen et al. for predicting the 113 sRNAs in C. acetobutylicum. Identification of new sRNAs was based on selecting interoperonic regions (IORs) with a minimal read count of 50. This metric was assigned based on the analysis of the RNA-seq data for mRNAs and sRNAs (Figure 1). Only IORs that met the criteria of a minimal read count were considered for further analysis. Computational prediction of sRNAs was performed using SIPHT based on the comparative analysis of the 21 Clostridium genomes in NCBI. The previously identified 113 sRNAs  were removed for predicting novel sRNAs. Thus, IORs expressed at a minimal read count of 50 and were also computationally predicted to contain sRNAs in the expressed IORs, were manually curated to eliminate false positives. False positives were defined as IORs, which had predominant expression only from the untranslated region (UTRs) of the neighboring genes, even though sRNAs were computationally predicted in those regions. Identification of false positives was carried out using a custom web viewer (generated using custom PHP scripts) by visually analyzing RNA-seq data. Northern analysis of select sRNAs was performed as described previously using single stranded oligo DNA probes . The probes used in Northern analysis are listed in Additional file 2: Table S2. For each lane, 10 μg of total RNA was loaded in a 5% precast polyacrylamide Ready Gel TBE-urea (Bio-Rad, Hercules, CA), and was electrophoretically resolved along with molecular markers of single stranded RNA ranging from 50 nt to 1000 nt (New England Biolabs, Ipswich, MA). Following electrophoresis, the RNA was transferred to a BrightStar®-Plus positively charged nylon membrane (Ambion). Probes were labeled with ATP [γ32P] using Optikinase (USB, Cleveland, OH) and the unincorporated radioactive material was removed using Micro Bio-Spin Column (Bio-Rad, Hercules, CA). The prehybridization and hybridization of the membrane with labeled oligo probes was carried using the ULTRAhyb hybridization solution (Ambion) at 42°C. Promoter prediction in the upstream region of the sRNAs were carried out using PSSMs of B. subtilis promoter consensus sequences . For the Lactococcus promoters, we used the promoter HMM model from the PPP tool . Rho independent terminators were predicted using RNAmotif , Erpin  and Findterm (http://www.softberry.com). Secondary structures of sRNAs were predicted using Vienna RNAfold [92, 93]. The sRNA nomenclature for the newly identified sRNAs was done in the same manner as described previously . We acknowledge the assistance of Dinesh Indurthi in training KPV for Northern analysis and members of Papoutsakis laboratory for their assistance during sampling of the cultures for RNA isolation. The work was supported by the genomic sciences grant from Department of Energy, USA (grant# DESC0007092). KPV and SWJ carried out the fermentations and RNA isolations. KPV carried out Northern analysis and drafted the manuscript. SGK constructed the libraries for RNA-seq. KPM processed the data and built the web browser. KPV and KPM analysed the data. KPV and MTR carried out the identification of new sRNAs and other computational analyses. BCM and ETP helped with data analysis and interpretation, and participated in the manuscript preparation. ETP conceived the study, participated in its design and coordination. All authors read and approved the final manuscript.